With many states requiring photographically reproducible seals now, we created the Self Inking Round Notary Stamp. The Self Inking Round Notary stamp's impression is identical to those found on embossers but just in the form of a stamp. It is easy to use and easy to re-ink. One of our top sellers, the Self Inking Round Notary stamp is a quality stamp that will leave crisp and professional-looking impressions every time it is used. Unsure if this is the right notary tool for you? Contact us! The Self Inking Round Notary stamp is a reliable and perfect for the fast-paced notary. The Self Inking Round Notary stamp is custom made with your personal notary identification information. Our experienced and detail-oriented team handcrafts each rubber die and stamp to ensure it will meet all of your state's specifications. 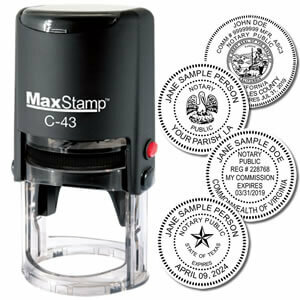 The Self Inking Round Notary stamp is mess-free stamp that can be used with little effort. This clean and professional stamp is sure to boost your confidence when notarizing documents. Re-inking and replacing the ink-pad is very easy and will not slow you down. The standard clear base and laser-cut rubber die assures precision stamping every time it is used.